Stuffed Animals and Plushies - page 1 - general furry discussion - Furtopia | Family Friendly Furry Forum and IRC Chat! Not sure if this is the right area for this topic; my apologies if it is not. I've got a decent collection of plushies, though over the years i've trimmed it down some (if only so that i have room enough on my bed to sleep.) What i'm wondering is what other peoples' collections might look like, and what sources they would recommend for getting more, as i'm having trouble finding anything that strikes my fancy. I have too many plushies to count. Most are in storage, except for my Build A Bear Twilight Sparkle and Rainbow Dash, a few of my mate's plushies, and a couple of my own. I've got The Lion King plushies, horses, dinosaurs, a dolphin, and a few others. If you can narrow your interest to a few species, maybe you can find a plushie that will suit you. One of my favorite brands is Fiesta. They make durable plushies of all kinds. I recently bought a Velociraptor plushie from Palaeoplushies, a custom plush maker. A good place to start plushie hunting is Amazon for general stuff, then deviantART. Quite a few customizers there. Actually several were my mothers.. I made one large dog plushie fashioned after "The Fluppy Dogs" Cartoon talking magical dogs. If you haven't seen the movie. I only have 4 plushies so far: 3 huskies and 1 wolf. Look for retail stores that sell gifts, keepsakes, and large selections of Hallmark greeting cards. Almost any toy store like Toys R' Us or FAO Schwartz. Stores or websites that specialise in environmental/wildlife projects or issues, etc. Google is your friend. Just do a search for "plushie" or "stuffed animal". You guys are the best! Finally, a place where people won't poke fun at me for having a plushie collection! That being said, i've already thoroughly searched around Amazon before my earlier post (and indeed found some good stuff), and anywhere that requires me to actually go somewhere would be entirely situational as far as me being able to get there or not. You see, i had assumed that since this is a furry forum, you'd have some magical source that only furries know about. I also have various Elder Scrolls plushies, a fair few palaeontology plushies, and a couple of reptiles. Mine mostly come from Amazon, but a few were hand-made for me. Loc... that is so AWESOME. I only have a couple normal eevees. I have a lot of foxes though. I used to have a bunch of those Webkinz plushies back in the day; not sure what happened to those. Also, I used to have this really cute wolf plush, but I've since lost him. I bet he is in my room somewhere. I have a pretty decent sized collection of them, ranging anywhere from dogs and seals to Spongebob. I know I at least have a few dozen beanie babies, generic plushies, branded stuff, and a few years ago I got a Wells Fargo Pony off of eBay. But most of them are boxed up and put away. I'm planning on making a giant Toothless plush this summer though, it's gonna be so awesome. I really love plush toys. Especially Pokemon ones. I had a rather large amount of them years ago but I got rid of all of them but my smaller Pokemon ones I could keep put away in a duffle bag. I added some small Pokemon ones back over the years, and I remade one of my large Pokemon I had before (Umbreon, better than ever), and I added a few larger store-bought ones (Snivy, Oshawott, Pikachu). I might make a Buizel (again) in the near future and that will likely finalize my personal collection. I'll try to get a pic of all of them sometime. I have a bunch of plushies that I've collected over the years. I have them all on my bed, and they take up about half of my bed. My two newest additions is a little Goomy plush and a dog one. @ZedCoyote: Shame on you! Didn't your mother ever tell you about no animals on the furniture! Is that Umbreon even housebroken? She's totally welcome on the bed and any other furniture! I also know to bring my Giant Hello Kitty and Chococat t conventions. Since the day somebody broke into my car and stolen a giant Hello Kitty plush, I bring her everywhere if I take my 3 ft plush out of my apartment including restaurants and shopping. I have 10 Hello Kittys One teddy and One Minnie Mouse I sleep with. I know which ones can fit into a suitcase to sneak on business or personal trips. I don't collect many stuffed animals, but I do like to collect figurines which are similar. I could buy a lot of this stuff online, but I try not to because I would like every item I collect to have a story or meaning to it - some memory of an event where I found it, or some person who gave it to me as a gift. Two of my favorites include a small painted model fox my mother gave me when I left for college and a prismatic, green 3D-printed fox my boyfriend gave to me for Christmas. These are just the ones I have here in Japan... I have more back home in the states. 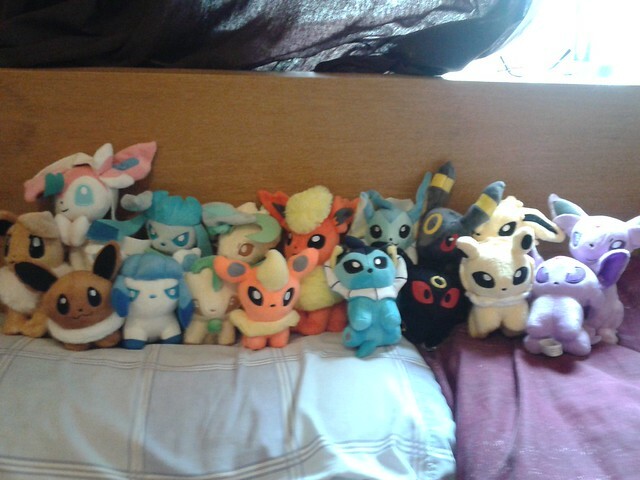 Hehe, hey, I have most of those plushies on the back row of the eeveelution, except the espeon. Of course, I have a ton of other plushies. Cats, sharks, octopuses, about 15 jellyfish, squids, dragons, and a variety of other things. Oh man... As I get ready to move house, I'm being confronted with just how much plush I have to pack and haul, haha. I'm going to have to pare down and let a lot of the big plushes go to new homes, but it's not easy. I mean, I've got, like... lifelong relationships with some of these guys. I've had that wooly mammoth for over thirty years! As for where to find them... well, it's harder if your favorite animal is less common. I'm afraid with felines, foxes, and bunnies, it's more a case of not buying all the great plushes I run across-- especially with the cats and buns. With my octopodes and other uncommon critters-- well, a couple have been gifts and I don't know where they were found, but zoo, museum, and aquarium gift shops can sometimes be great sources of odd animals, and Amazon has turned up a lot of cool plush Australian animals. Not a huge fan of plush. I don't have any straight up plush anymore. I have a few animatronic plush dogs like FurReal Friends and WowWee alive dogs. Mostly I prefer plastic figures like my vinyl poseable Pound Puppy, my Snoopys and my Chubby Puppies toys. I also have quite a few robot dogs. Four Poo-chis, four Zoomer Puppies and my I-Cybie who goes everywhere with me. Also I only have canines. I have zero interest in toys of other species. Those are cute little foxies.. I bought "Peter Rabbit", and his Mom for my GF there. I actually love collecting plushies i usually snuggle with mine every night, and when i wake up from a bad dream i just keep them close. They help when im feeling sad i just cry in them and put all of mine on my bed, it makes me feel protected. I love collecting plushies, and im planning on buying more eeveeloutions.